The world as portrayed in Marvel Comics, especially under Stan Lee, Steve Ditko and Jack Kirby. As in The DCU, Marvel heroes form teams and Crossover occurs frequently, with many Continuity Nods. (In fact, you could argue that Marvel invented the Continuity Nod.) Many of these comic books have been the basis for movies, TV series or both. Currently owned by Disney; a striking parallel to Disney's old animated shorts rival Warner Bros owning The DCU. Spider-Man, a 1967 cartoon version, with an Expository Theme Tune that many baby-boomers can still sing from memory. The Amazing Spider-Man, a 1977 live-action series, cancelled due to Executive Meddling when CBS decided they were running too many Superhero series. Spider-Man Unlimited, a short-lived 1999 cartoon where Spidey is transported to Another Dimension. Originally intended to be based on Spider-Man 2099... a comic book title many fans argue Bruce Timm ripped off when developing Batman Beyond. Spider-Man, a 2002 big-budget movie, considered to be (along with X-Men) one of the causes of the current superhero movie boom. Has had two sequels, in 2004 and 2007. A Continuity Reboot called The Amazing Spider-Man is slated for a 2012 release. As well, he showed up in segments of The Electric Company, where he taught reading to kids by having adventures while speaking only in word balloons. The Spectacular Spider-Man a 2008-2010 series, featuring Peter Parker as a high-school student, which aired on Kids' WB and then Disney XD for two seasons. Ultimate Spider-Man, a animated series that premiered in 2012, where Peter, also a high-school student in this show, is being trained by SHIELD to be a professional superhero and teams up with a variety of other Marvel superheroes. Generation X was a failed Pilot Movie from 1996, featuring the characters of the X-Men comic-book Spin-Off who attended Xavier's mutant school. X-Men Evolution, a 2000 cartoon with it's own continuity. X-23, a Canon Immigrant, originated here. X-Men, a 2000 big-budget movie. Had two sequels, in 2003 and 2006. A 2009 Wolverine prequel has been released, as well as a 2011 prequel called X-Men: First Class set in the 1960s. Wolverine and the X-Men, a 2008 cartoon series (which aired in 2009 in the US), is the latest adaptation. It dives straight into a spinoff of the comics continuity, so in tone it's closest to the 1992 cartoon (but in art it's more like Evolution). Canceled after one season. Two Anime shows, one based on Wolverine, and the other on the X-Men, were made in 2011. Fantastic Four, a 1967 cartoon produced by Hanna-Barbera. The Fantastic Four, a 1978 cartoon with the Human Torch replaced by the robot H.E.R.B.I.E. Fantastic Four, a 2004 big-budget movie with a 2007 sequel, Fantastic Four: Rise of the Silver Surfer. Fantastic Four: World's Greatest Heroes, A 2006 cartoon version with heavily anime-influenced french-influenced art, based loosely off the movie continuity. The Marvel Superheroes, a 1966 animated anthology. Hulk Vs, a 2009 OVA wherein he causes numerous headache for Wolverine and Thor. A pair of 1970s Made For TV Movies, featuring a Legacy Character version who rides a motorcycle. A 1990 theatrical movie so bad the production company never released it and denied it existed. It was finally released on home video in 1992. A 2011 big-budget film version called Captain America: The First Avenger. A 1994 cartoon version, shown with the contemporary Fantastic Four cartoon as part of the "Marvel Action Hour." Season 1 saw Shellhead leading Force Works, but a massive Retool for Season 2 saw - among other changes - more solo hero action. A 2007 OAV, The Invincible Iron Man. Iron Man, a 2008 big-budget movie, and its 2010 sequel. Iron Man: Armored Adventures, a 2009 CGI animated TV show which has a sassy teen Stark as quipping Spidermanesque incarnation of Iron Man. A Live Action Adaptation, directed by Kenneth Branagh and featuring Chris Hemsworth (Captain Kirk's dad) as Thor. BRIAN BLESSED!! was originally tapped to play Odin, but quickly replaced by Anthony Hopkins, released in 2011. Blade the Series, a short-lived 2006 TV adaption, was based on these films. Blade, a 2011 12-episode anime series. The Avengers: United They Stand, a 90s cartoon that barely featured any of its three most famous members. The Avengers: Earths Mightiest Heroes, a animated series that began in 2010 and features the "classic" roster - Iron Man, Captain America, Thor, Hulk, Ant-Man and Wasp - with more superheroes added over the course of the series. A big-budget feature film, starring the cast of the recent Thor, Captain America, Hulk and Iron Man movies, released in 2012. None other than David Hasselhoff played the title character in Nick Fury: Agent of S.H.I.E.L.D, a 1998 Made for TV Movie, and did a surprisingly credible job at it (though the movie failed in other respects). A new version of Nick Fury (this time played by Samuel L. Jackson) plays a key role in the Marvel Cinematic Universe, putting together the Avenger team. The film adaptation has been announced, though no date has been set. The series original creator, Brian K. Vaughan will write the screenplay. Appears in the 2009 X-Men Origins: Wolverine film, played by Ryan Reynolds and Scott Adkins when he is converted into Weapon XI AKA Deadpool In Name Only. A spin-off movie has been discussed. And is now apparently in the works. "Thunderbolts", or at least lets just call them that. Dracula existed in the Marvel Universe; he ran into Spider Man and the X-Men a few times, and had his own series, The Tomb of Dracula. He was one of many vampires, but (usually) the most powerful of them and their acknowledged leader. The Marvel Superheroes was a syndicated 1966 cartoon that was the first TV appearance of the Marvel Universe. 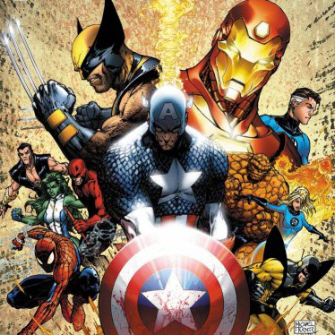 It featured Captain America (comics), Iron Man, The Incredible Hulk, Thor, and Namor, the Sub-Mariner in Three Shorts segments, with plots, dialogue and even artwork often taken directly from the comic books. The Silver Surfer had a short-lived 1998 animated series, most notable for being cancelled right after a Cliff Hanger where the universe ceased to exist. The Superhero Squad Show, a 2009 animated Massive Multiplayer Crossover meant for small children, featuring Super-Deformed versions of the Marvel heroes and a Lighter and Softer storyline. Based on the Marvel Super Hero Squad toy line, except without Spider-Man, of whose TV rights Sony wouldn't let go. Marvel has announced plans to create shows for ABC and ABC Family based on Jessica Jones, Mockingbird, and Cloak and Dagger, but no actors are attached as of yet to any of the shows. In 1991, a Pilot Movie was made for Power Pack, but was never aired. Even so, it still has an IMDB entry. Bootlegs of the pilot have caused some to assume it did get an actual broadcast in some markets, but as of yet there has been no proof. The Punisher appeared in two different movies, both with no continuity to each other, made 15 years apart (1989 and 2004). They did it again in 2008, with Punisher: War Zone. The Ultimate Avengers OAV, based on the comic The Ultimates, was released on DVD, February 21, 2006. A sequel was released on August 8, 2006. A big-budget Ghost Rider film starring Nicholas Cage was released in early 2007. As well, Marvel Entertainment has announced that they are planning future movie projects for The Avengers, Nick Fury, Black Panther, Ant-Man, Cloak & Dagger, Dr. Strange, Hawkeye, Power Pack, and Shang-Chi. The set-up of The Avengers movie in Iron Man and Tony Stark's cameo in The Incredible Hulk suggest that Marvel may be trying to place the movies independently produced by Marvel Studios into their own continuity. An animated Black Panther TV show is under development for BET. A God Am I: Thor, Hercules, Zeus and Odin make their godly heritage known to all who meet them. All Powerful Bystander: The Living Tribunal is this until a multiversial threat arises. He tends to destroy the universe the threat is located in and then resume being a bystander. Alternate Universe: A number of Marvel stories deal with and take place in these. Most prominent (and Alternate Continuity examples) are listed below. Arms and Armor Theme Naming: The covert organizations S.H.I.E.L.D., A.R.M.O.R., S.W.O.R.D. and H.A.M.M.E.R. Badass Bookworm: High Evolutionary, Thanos, M.O.D.O.K., Leader, Valeria, Reed Richards, Alyssa Moy, Mad Thinker, Hank Pym, Doctor Doom, Maelstrom, Brainchild, Bruce Banner and Spider-Man. The Berserker: Hulk, Juggernaut, Colossus, Thing, Thanos, Wolverine and Thor when he delves into the Warrior's Madness. Iron Man was the first superhero with a substance abuse problem. Bolt of Divine Retribution: Anyone with power over electricity and a vengeful nature. Thor and Zeus are notable examples. Broke Your Arm Punching Out Cthulhu: Iron Man actually believed he could put Thor down by himself. He was very wrong. Comic Book Time: When he revealed himself during Civil War, Peter Parker stated that he had been acting as Spider-Man since he was 15. Same goes for the first X-Men team, who started in heroics in their teens (sans Beast), and now almost 50 years later (in real time), they still seem to be 30-somethings. Conqueror From the Future "Kang the Conqueror" is quite likely the Ur Example. Crapsack World: Few comic book universes make life harder on its heroes than the Marvel Universe. At different times, either the public hates them, the government actively tries to kill mutants, the media paints them as evil, or laws have been passed making most of them wanted fugitives. And that only covers Earth, which probably contains only a fraction of all the combined power in the universe. The Marvel Universe is crawling with cosmic beings such as Galactus and countless others who have all been either indifferent to or outright wanted to massacre the Earth. Deconstruction: Arguably a founding father of the concept for superhero comics as it definitely helped popularized the idea of Fantastic Racism for the genre. (People don't seem to notice as much due to how the earlier Marvel comics were not truly Darker and Edgier.) But still Marvel is definitely one of the reasons why being a super powered being (especially if you were born with super powers) might not get you respected. The Dreaded: The Void. And the Sentry by default, as everyone just knows he's going to snap one day. Then he does. Easily-Conquered World: When you look back at history, not so much. When one prospective conquering race heard about everything Marvel Earth has fought and beaten, they ran. Ran. Everyone Is Related: Due to the Summers' Tangled Family Tree. Fantastic Racism: Marvel is very well known for this; documentaries have suggested that one reason for Marvel's popularity in the 60's was its use of resonant contemporary themes like bigotry and the marginalization of minorities. Fun with Acronyms: Recurrent with any organization that uses an acronym (see Arms and Armor Theme Naming; another prominent example is Advanced Idea Mechanics, or simply A.I.M. ); subverted with H.A.M.M.E.R. in which Norman Osborn first came up with the name without an acronym behind it and, even after he was arrested and broken out again, no one knows what it stands for. Genius Bruiser: Many of the most intellectually gifted characters that exist are also extremely skilled when it comes to battling, whether through superpowers or their own training. Healing Factor: A very common ability once you get to the bigger tiers. Wolverine, Deadpool and Hulk are the three most popular examples. Humans Are the Real Monsters: X-Men comics are the clearest example, but this trope shows up in other series as well. I Love Nuclear Power: Every Hulk powered by gamma radiation and Hulk's nemesis Abomination. Peter Parker was bitten by a radioactive spider, which gave him the abilities of Spider-Man. Immortality: Marvel has at least one character who embodies each type. Immortality Hurts: To his credit, Deadpool has fun when he gets mutilated, shot, stabbed, burned, decapitated, skinned and liquefied, mostly because of his habit of being a funny guy, but he still feels the pain. Indecisive Medium: The movies set in the universe start with the Marvel logo with the flipping comic book pages. Mad God: Thanos. Thor as well when driven to Warrior's Madness. The Omnipotent: It really depends on one's definition of omnipotent. The Living Tribunal has been called omnipotent by several different characters, yet multiple beings have surpassed his power (Beyonder, Thanos, Protege and Molecule Man) and defeated him. The Infinity Gauntlet grants the wearer omnipotence but every being who has ever worn it has had it forcibly taken from them. One Steve Limit: You better believe this trope is averted. There are easily half a dozen characters named James (Wolverine, War Machine, Bucky), a good few Henrys (the original Ant-Man/Giant-Man/Goliath/Yellowjacket and so on, Beast), and plenty of Peters (Spider-Man, Trapster). Reptiles Are Abhorrent: with some aversions and subversions. Ruined FOREVER: Believe Some fans now that Disney Owns Marvel Entirely. Sociopathic Hero: Most prominently Deadpool, Wolverine, Punisher, and Moon Knight,. Super Registration Act: Has happened on more than one occasion, the most recent one being Civil War. Token Minority Couple—Black Panther was paired off with Storm because they were both African, and no other reason then that. Well also they both knew each other from past adventures, lost there virginity to each other, and two very powerful people. Too Dumb to Live: Many characters have had moments of this but it's hard to believe someone knows Bruce Banner can turn into the Hulk, yet they still try to piss him off. World War II: The Golden Age. Marvel's history began during this time, so its original characters live in this setting. Some legacy heroes/villains are also based on characters published in this time (such as the Human Torch). Note that Adolf Hitler was seemingly killed in his bunker by the original Human Torch, but actually survived for a while as the Hate-Monger. WWII Golden Age characters in present day: Namor the Submariner, Captain America (comics) (both Steve Rogers and Bucky Barnes), Red Skull, and many others. WWII Retcon characters in present day: Nick Fury, Dum Dum Dugan, Spitfire, Baron Strucker, Magneto, Wolverine. This page was last edited on 11 April 2017, at 04:00.